The more I walk the gardens of this world, the more I am reminded just how little I know. How is it possible that I have not come across Bidens aurea “Hannay’s Lemon Drop” before? It is unlikely that I could have walked past this beauty and not been stopped in my tracks. Supermodel elegant, fashionably late flowering, with chic-ly understated flowers, the only embellishment being each petal end is dunked in virginal white. Of course there may be hidden secrets, not apparent on first meeting, perhaps invasive or short-lived or high maintenance. For this instant I didn’t care about any potential foibles, I was happy to admire the perfect airy blooms against the clear autumnal sky. 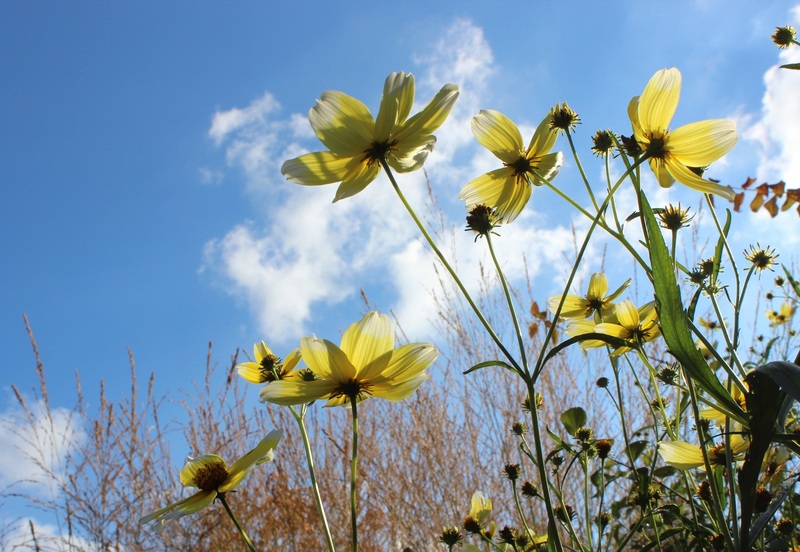 UncategorizedBidens, Bidens aurea "Hannay's Lemon Drop"
Lovely photo, looking up through the sunlit petals into the sky with its puffy clouds. When I was a young gardener, I used to be a frequent visit to Hannay’s nursery in Bath (now closed). It was wonderful and got me into more unusual perennials. Many of the plants I bought there, including Inula magnifica, Cephalaria gigantea and a tree peony are still going strong in my parents’ garden over 20 years later. Thank you for this piece of garden history, really interesting. Sounds like you have always had impeccable taste. Just ‘seen’ this at one of my clients gardens ~ not actually seen for the first time but to be able to put a name to it. I’m happy to say that it spreads but not intrusively and it seems to thrive on neglect! It’s only just started flowering! I will see what I can find in a few weeks.